“Be present” is something we’re hearing more and more these days, which is great advice, but who has the time? Sure, I’ll be present when the kids are quiet, it’s peaceful, and the last present is bought. If you are like me, that leaves little time to be present unless you are willing to get up at 2:30 in the morning. Fortunately, God did not wait for everything to be calm before he sent his son, Jesus, to be present with us on earth. God did not wait for conditions to be perfect. As you read in the Bible, Jesus presence on earth started in the midst of scandal, serious danger, Roman rule, and potential death from King Herod that we read about in Matthew 2. “Be present”is something we’re hearing more and more these days, which is great advice, but who has the time? Sure, I’ll be present when the kids are quiet, it’s peaceful,and the last present is bought. If you are like me, that leaves little time to be present unless you are willing to get up at 2:30 in the morning. Fortunately, God did not wait for everything to be calm before he sent his son, Jesus, to be present with us on earth. God did not wait for conditions to be perfect. As you read in the Bible, Jesus presence on earth started in the midst of scandal,serious danger, Roman rule, and potential death from King Herod that we read about in Matthew 2. God showed us that peace was not a prerequisite to being present. How peaceful and present are you feeling this holiday season? We find ourselves worried about getting the right presents, frustrated with our overspending, and getting angry with our loved ones. We are more concerned with buying presents than we are about being present. 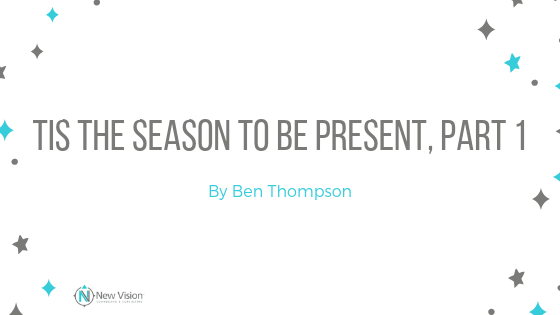 Ironically, we are in a season of year focused on the presence of God on earth, and it is one of the hardest times to be present. Being present means being in this moment, peaceful or not. It means taking a breath right now and calming down. It means stopping in the middle of a fight with your spouse or your kids, taking a breath, and asking yourself, “What’s most important to me right now?” When you slow down and pay attention to your body, mind, and soul, you are present.Then, you can make better decisions for yourself and those around you. There is no better time than to be present than right now. Jesus presence on earth brought peace to a chaotic world. Likewise, our presence can bring peace on earth,peace to our families, and peace to ourselves in spite of all that is going on around us. In the next part of this blog series, I’ll teach you more ways you can become present in your everyday life.